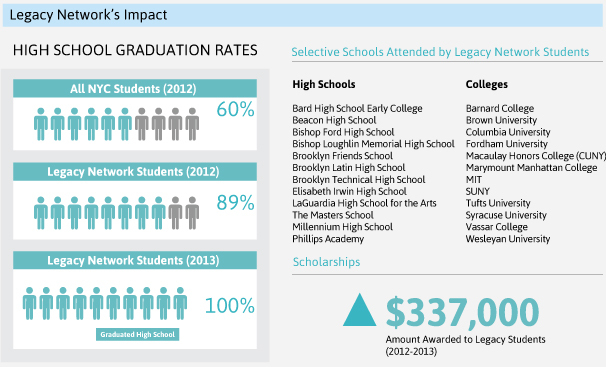 After graduating from our elementary and middle schools, The Legacy Network serves as the catalyst for our student's continuing success in high school and college. 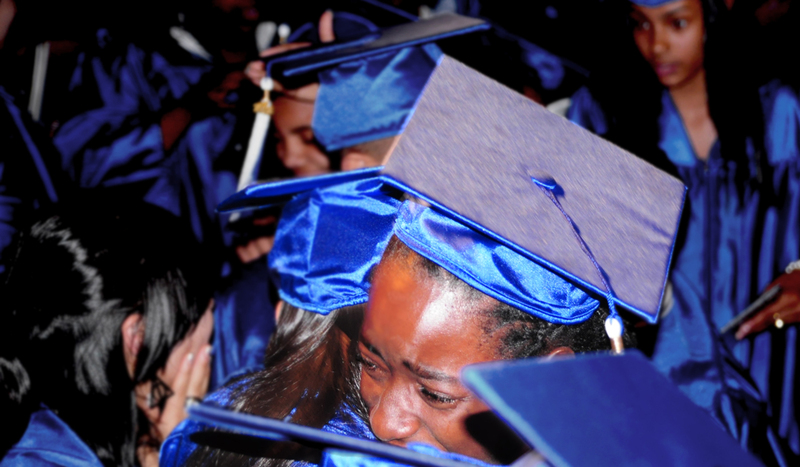 The program provides mentoring, academic enrichment and a supportive social network to help our graduates make the critical transition to high school, college, and career. Throughout a student's high school career, the Legacy Network provides academic enrichment through Scholar Academies in mathematics and English language arts, SAT preparation, tutoring, mentoring, college trips, and grade- level guidance advisories. Our students are also introduced to career exploration via corporate mentoring programs and internships. Each year, forty high school and college students participate in our paid Summer Internship Program. Our students have participated in internships with organizations such as Prospect Park Zoo, Beth Israel Medical Center, American Civil Liberties Union, Flatbush Development Corporation, Columbia University Office of Diversity, and in the City Council Offices of Jumaane Williams and Letitia James. The support we provide has helped our alumni excel at competitive secondary schools such as Brooklyn Technical, Millennium, Brooklyn Latin, and Philips Academy Andover; and colleges and universities such as Harvard, Wesleyan, Fordham, Tufts, as well as the SUNY and CUNY schools. In the fourth through tenth grades, the Legacy Network provides targeted services designed to help students and families successfully manage the key points of transition from elementary to middle school and middle to high school. These supports include guidance in high school choice and selection, SHSAT, and math regents preparation. The program also emphasizes academic enrichment and early college awareness through "Jumpstart to High School" summer bridge programs held in partnership with institutions like Colgate University. Through the Legacy Network's Creative Approaches to Literacy [CAL] initiative, students also have the opportunity to explore issues of self-esteem, cultural identity, and citizenship. The CAL initiative nurtures adolescent development while strengthening writing and critical thinking skills, and increasing student exposure to the arts. "I learned the importance of investing in my future"
I am truly grateful for all the help and opportunities Beginning with Children has provided me. They've taught me so much about myself and my capabilities over the years. As a participant in the Professional Training and Summer Internship Program, as well as the Mentoring Program, I not only learned how to create my own resume or complete my own FASFA, I also learned the importance of investing in my future. Through the Summer Internship Program, I found out that I don't really want to pursue a career as a veterinarian but also realized how determined and persistent I am. Not many children in high school can say they know how to do their own resume or that they visited the trading floor at the New York Stock Exchange. I truly believe that if it wasn't for the Alumni Program at Beginning with Children, I would not be as optimistic about my future. The people on the alumni team are really passionate about their jobs. People like Tomomi go above and beyond their job description to help students like me succeed. I am proud to say I am an alumnus of Beginning with Children. "Beginning with Children has been like a third parent"
I have been with them since pre-k. Even after I graduated from middle school, they stood with me through the Alumni Program. We went on overnight college tours and did many things that prepared me for college. The Professional Training and Summer Internship Program was my guide to working in the real world. I had the opportunity to intern at the Flatbush Development Corporation (FDC) as a camp counselor. This experience taught me how to be a leader and role model and helped me grow into a mature and responsible adult. I think everybody should have the same opportunity that was given to me. "I learned that I can achieve anything I want to with the right amount of determination"
When I first started the Beginning with Children mentoring program at Neuberger Berman, I had no clue where my life was heading, what college I wanted to go to or how to get through the college application process. Over the course of the four years, however, I learned that I can achieve anything I want to with the right amount of determination. My mentors acted like a family to me and gave me the self-confidence to reach for the stars. They also helped me gain a better sense of myself. Now I know exactly what I want to do: to pursue a career in early childhood education.